The Falkland Islands, a cluster of 780 islands off the eastern coast of Argentina, had no indigenous population when the British arrived to explore the islands in 1690. Continuous settlement dates only to 1833, when British forces removed 26 Argentinian soldiers from the islands and claimed the islands for the British. In 1845, the Capital city of Stanley, located on East Falkland, was established. Argentina also has a claim to the islands, and in 1982, Argentine forces invaded the Falkland Islands. The British moved to defend the British control of the Islands, with Prime Minister Margaret Thatcher calling the Islanders "of British tradition and stock". In under three months, nearly a thousand people were killed, and over 2,000 were injured. British-Argentinian tension regarding claim to the Islands still exists, but as over 98% of Islanders voted to remain under British sovereignty in the last election, the identity of the island overall is overwhelmingly British. This history has implications for the linguistic features of Falkland Islands English, which is similar to British English but distinct in some vocabulary and phonology. English in the Falklands is non-rhotic. This is consistent with other varieties of English in the southern hemisphere. One major difference between the English of the Falklands and other Englishes of the southern hemisphere is the onset centralization of /ai/, in which nice is pronounced /nəɪs/. The Falklands English vernacular has a fair amount of borrowed Spanish words (often modified or corrupted). These include colloquialisms such as ‘che’, also encountered in Rioplatense Spanish from Argentina, and ‘poocha’ equivalent to ‘wow’. or ‘damn’, (from pucha, a euphemism for puta or ‘whore’). ^ a b Pereltsvang, Asya. "Falkland Islands English". Languages of the World. Retrieved 24 March 2018. ^ "Our History". Falkland Islands Government. Retrieved 24 March 2018. ^ Tweedie, Neil (12 March 2013). 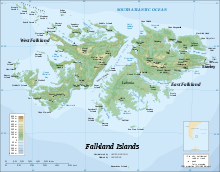 "Falkland islands referendum: who were the three 'No' votes?". Retrieved 24 March 2018. ^ a b c Hickey, Raymond (2014). A Dictionary of Varieties of English (1 ed.). p. 119. Retrieved 24 March 2018. ^ a b Spruce, Joan. Corrals and Gauchos: Some of the people and places involved in the cattle industry. Falklands Conservation Publication. Bangor: Peregrine Publishing, 1992. 48 pp.